Two patron saints compete for the old Hercules’s town: Saint George and Saint Peter. 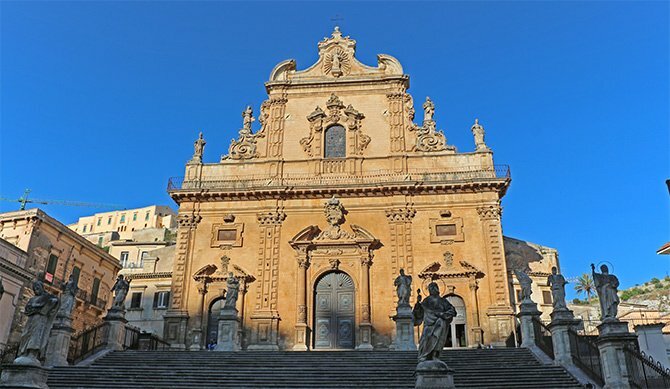 For centuries the citizens of Modica have been dived into the “Sangiuggiari” and the “Sampittrari”; each group is intensely attached to its protector saint. St. George Feast Day is celebrated during the weekend that follows April 23rd, Saint Peter is celebrated in summer, on June 29th. On that day, a big torchlight procession is held and a statue, representing the miracle of St. Peter healing the paralytic at the gates of the Temple, is carried through the streets of the historic downtown. As a matter of fact, during the procession, people carry a group of two statues made, in 1893, from oak wood by Benedetto Civiletti, a sculptor from Palermo. It is a very solemn event, but in the past the procession was even more majestic: up until 1953, the Saint’s relics were carried around on a silver arm through a cortege of 24 saint statues of colossal stature, called “I Santuna”. St. Peter Fair is what makes St. Peter Feast Day one of the most eagerly awaited events in Modica: plenty of stands fill the historic downtown during the last three days of June, attracting locals, people from the surrounding areas and tourists who get fascinated by the market food’s vibrant colors, and by the flavors and the smells of the traditional delicacies displayed on the vendors’ counters. St. Peter feast day, St. George feast day and the Madonna Vasa Vasa’s procession represent the typical Modica’s baroque-style celebrations at their best: all the traditional feasts in this town, once capital of an important county, are an explosion of energy, religious zeal and sense of belonging to one’s hometown. Edel Modica, located in the historic downtown, allows each visitor to get emotionally involved in these traditional events: you just have to step out of the hotel to be immediately immersed in Modica’s history and traditions. Your experience at Edel will make your journey more unique and unforgettable than a simple tour of monuments and museums.